Now that the Super Bowl feasting is over, it’s time to get back on track. (Congrats, Saints!) And this low calorie Philly Cheese steak Recipe is the perfect meal to help you be good, but still tastes like you are being bad. With a 7 Points per serving, it’s a MUCH healthier version than the traditional cheese steak recipes which can clock in at over 22 Points per sandwich. Yikes! Though this is not and official one of Weight Watchers Sandwich Recipes, it’s a great alternative to the real thing for anyone who wants to indulge without the bulge. It’s pretty easy to make, tastes great, and offers a wonderful way to enjoy a lower point version of one of the greatest sandwiches ever!! Preheat oven to 375°F. Coat a large nonstick skillet with non-fat cooking spray and sauté onions and green peppers over medium high heat until tender and golden brown, about 10 minutes. Remove onions & green peppers from pan; set aside. Add steak slices to skillet and sauté until browned and cooked through, about 1 to 2 minutes per side. Add Worcestershire sauce, salt and pepper; cook until liquid is absorbed. 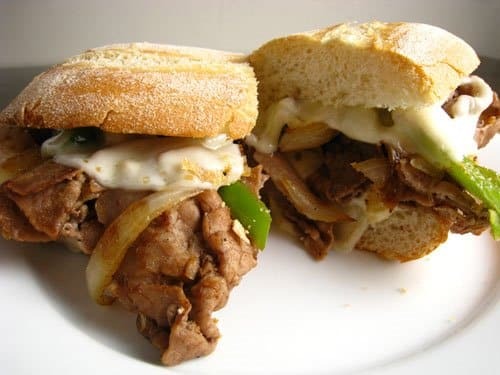 Divide steak evenly between 4 buns and top each sandwich with onions, peppers and a slice of cheese. (I sliced my cheese in half to make it easier to cover the whole length of the sandwich. Wrap in foil, transfer to oven and bake until cheese melts, about 5 minutes. Just curious if you happen to know the calories, fat, protein, etc. for this recipe? I don’t do weight watchers but I love your recipes! Just saw this recipe, it looks amazing, one question is the 7 points the old points or the points plus? I can’t wait to give this a try…. Tried these and used the Sara Lee "Lite" wheat hotdog buns and the WW American Cheese slices. Absolutely delicious!! Would using chicken tenderloin strips, cut into pieces, reduce the caloric value of this? Absolutely. Using chicken breast tenderloin instead would probably knock about 2 points off. You'll have to add up all the calories/fat/fiber of couse in order to get an accurate new point count, but using chicken instead of beef will definitely lower it. What kind of rolls are pictured and where do I find them? They look awesome. These were store brand rolls from Trader Joe's. It's not always easy to find low calorie rolls, so you'll really have to look at the labels when you are at the store. And don't be afraid to check ALL brands…you'd be surprised at what you can find. Also, look for rolls that are higher in fiber…that will help to keep the points count low.